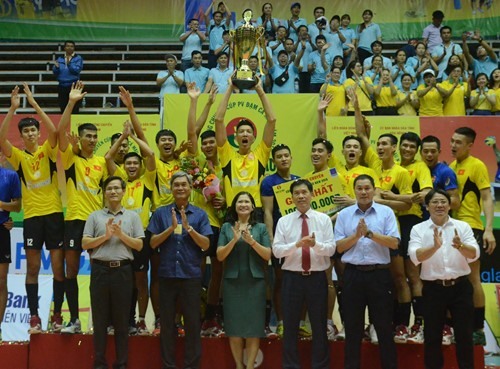 HÀ NỘI — The Sanest Khánh Hòa men’s team were crowned champions at the national PV – Cà Mau Protein Volleyball Cup 2018, which concluded on Sunday in the central highland’s province of Đắk Nông. The team beat defending champions Tràng An Ninh Bình 3-2 in the final round. In the first set, the Khánh Hòa team with many young players led first at 21/17, then 25/23. However, captain Giang Văn Đức of Ninh Bình, also the No 1 setter of the national team, managed to even the score. Later, as Khánh Hòa’s top player Từ Thanh Thuận sustained a minor injury, libero Nguyễn Thanh Tùng and hitter Nguyễn Hoàng Thương evened the score 1-1 to Ninh Bình after winning 25/20. As the third set started, Ninh Bình continued to pressure Khánh Hòa though they have the best hitter of the Asian Volleyball Club 2018 Nguyễn Đình Nhu, and pushed on to 2-1. Young talents of Khánh Hòa were added in the fourth set, as Quang Đoàn helped the team shorten the gap at 25/22, and Văn Tiên, Triển Chiêu, Thanh Phương, Nhu and Thuận finally raised the score to 3-2 (15/10). They were awarded $4,266 for winning the gold medal. Previously, Vietinbank defeated Mikado Thái Bình 3-0 to win bronze in the female group.